Singing, dancing and merrymaking of all kinds! This beloved celebration is not to be missed! The tree lights up at 7:30pm in the center of the ice rink in the plaza. 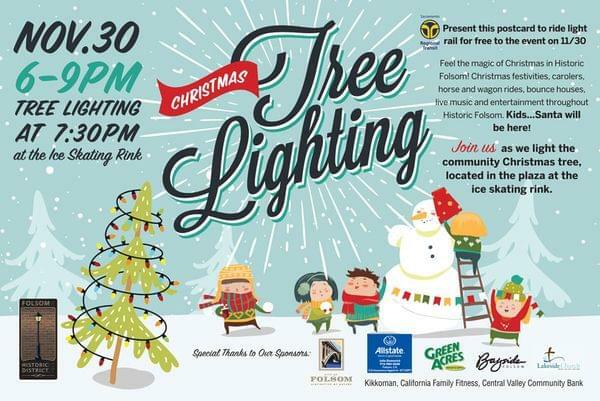 Enjoy the Bayside Children's Choir, Folsom Jr. High Choir, Folsom High School A Capella choir and the Sutter Street Theatre choir, all performing at the tree lighting, beginning at 6pm. Vista Del Lago's Egals will be dancing in the streets! Bounce house, face painting, balloon animals, horse and carriage rides, chestnuts roasting and so much more. RIDE RT to the event for FREE. Just show this on your smart phone for a free ride to and from the event on 11/30. Make it part of your holiday experience! Santa and the Grinch will be there! Don't miss it! The count down is at 7:30pm. See you there!